Phoenix, USA January 21, 2015 – Unique Companies of Phoenix, Arizona has been awarded “Best Of Houzz” for Customer Satisfaction by Houzz, the leading platform for home remodeling and design. The BEST of the BEST swimming pool and landscape company was chosen by the more than 25 million monthly unique users that comprise the Houzz community from among more than 500,000 active home building, remodeling and design industry professionals. Unique Companies attention to customer service and emphasis on cooperation and coordination between swimming pool, structures & patio covers, and landscaping (design & construction) sets us apart from our competitors. Unique Companies specialize in all aspects of landscaping, pool construction and swimming pool remodeling. 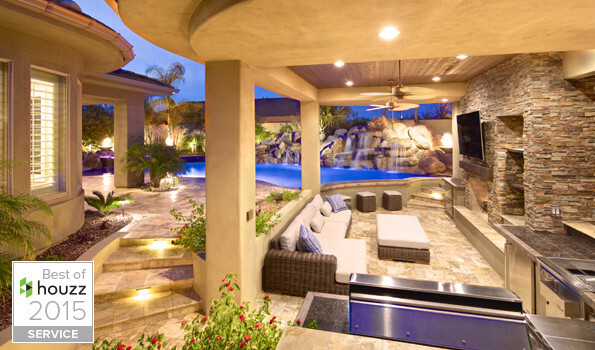 Unique Companies build everything from swimming pools to complete backyard environments, allowing you to enjoy ‘Outdoor Living’ in Arizona to the fullest!